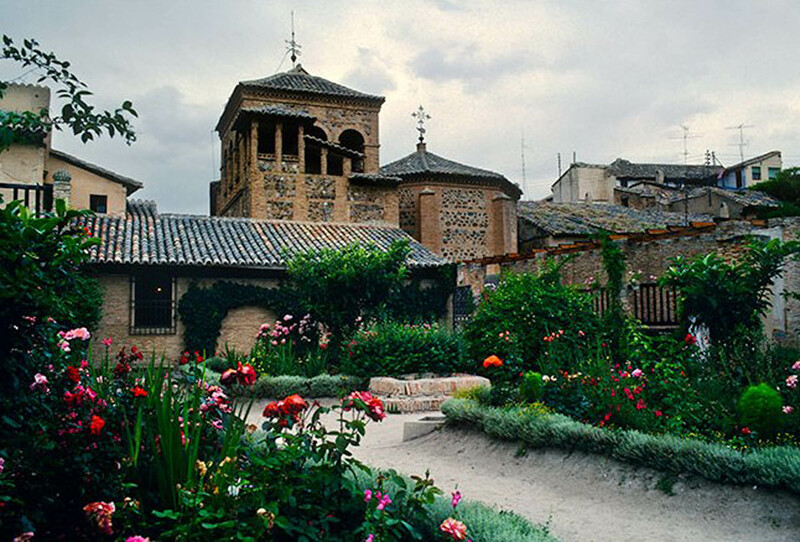 The approach to Toledo is particularly moving as one senses that this continues to be the landscape of Greco’s “Toledo.” Even though the city of Toledo is completely a “tourist” place, the old buildings impress, the site is dramatic and the paintings are marvelous. We got to the cathedral (not at all like a French cathedral). The remembrance of pain and death is everywhere about—there is an ecstatic indulgence in it. Next, we go to the synagogue (a fascinating Moorish structure) and to Greco’s house where we see some late works. There are many pictures and it is affecting to feel that this is the place in which they were painted. The gardens adjoining the house are beautiful. The architecture is very much what I respond to, is surprisingly simple and is intimate in scale. Our driver has had a number of close calls on the road to Toledo and we are surprised he can navigate the narrow streets of Toledo so expertly. Just as I was remarking about this to John (he had passed through a street that left barely an inch of clearance on either side of the car) he drove into a tree head-on as he was attempting to park at Greco’s house. He found this absolutely hilarious and we too were laughing. The return trip on the road to Madrid was less amusing however and after a near accident, I told him to slow down. We returned to the Ritz at about 5:00 p.m., a little worn by his driving (Spanish drivers are frustrated bullfighters—they are continually seeking the “moment of truth” on the highway) and hot and dusty. 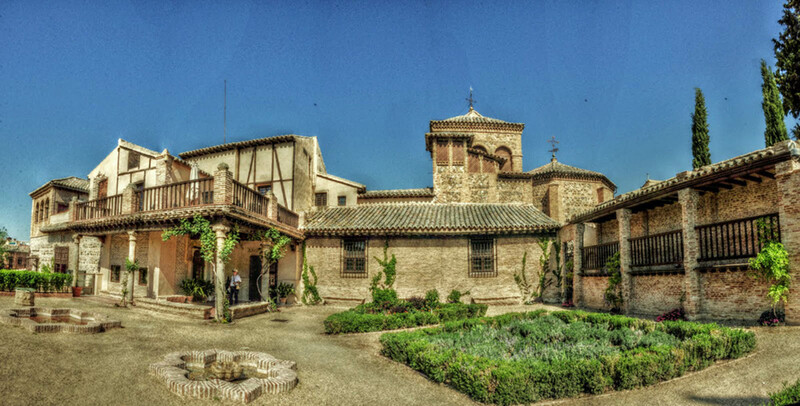 We had taken a good many photos as we drove around Toledo and our day was very full of diverse sensations. After our siesta, we dined at Horcher, another top rank restaurant. 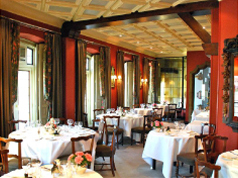 A handsome interior—white table clothes—beautiful glasses, silver pitcher with fresh flowers, heavy silverware—small, irregularly shaped interior with many small balconies and large French doors. Another excellent dinner. John has now acquired the habit of fine brandy and a Habana. We sleepily walk back to the Ritz and then to bed. Prado from 12:30 to 4:30. Lunch in the Prado courtyard. 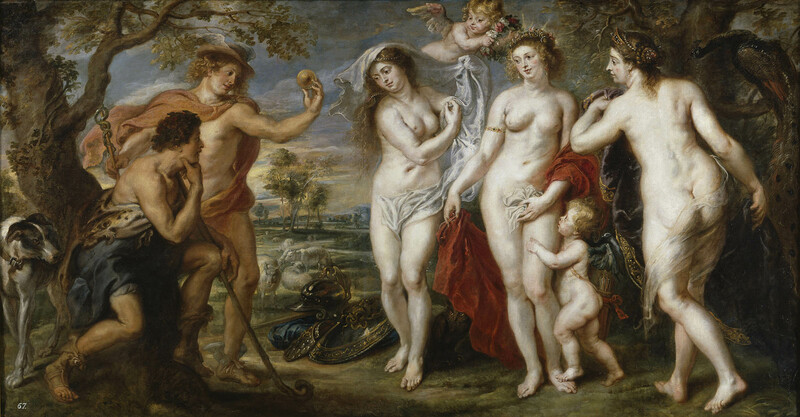 This day the extraordinary range and quality of the Prado came home to us. It was the accumulative power of Spanish painting, which separated the Prado from other museums although its collection of Flemish and Italian art is also of the highest quality. 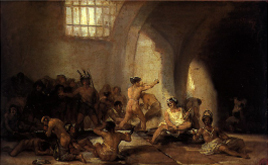 Hispanic works establish clearly that which is essential to the Spanish pictorial temperament. In seeing this Flemish concept transformed, one is aware of those particular qualities of austerity and sober drama particular to the Spanish painter. Everywhere there is blood; it is carefully documented in the precise articulation of its flow from sharp incisions. Dismembered fragments of body abound. A mystique of revelation through a sea of pain, blood and death. Velasquez, Greco and Goya each strike with uncanny impact. 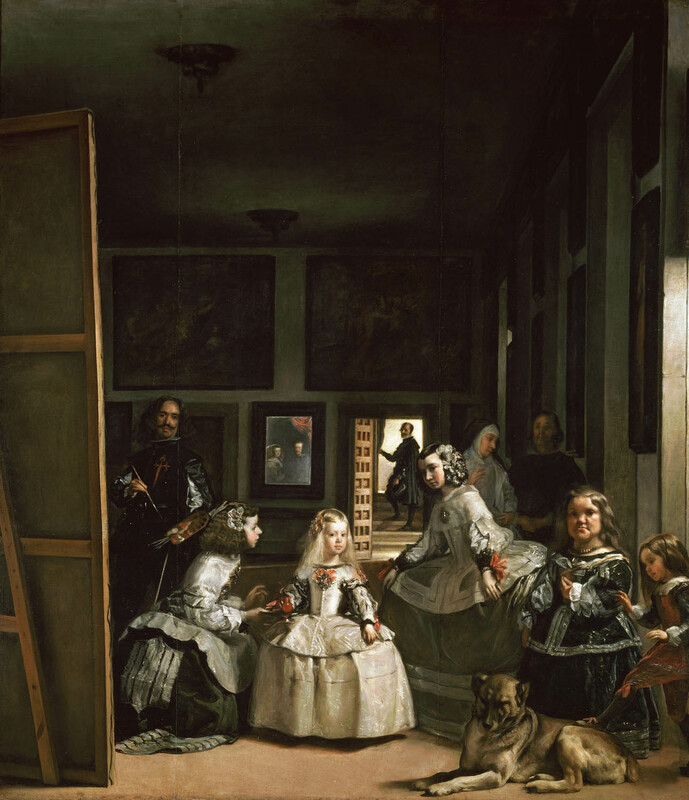 Las Meninas is an extraordinary experience. 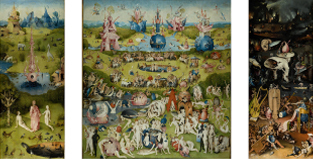 It must certainly be a unique painting in the entire history of art. Much to my surprise, the formal and equestrian court portraits of Velasquez particularly impressed me. Ribera fell in my estimation. There is melodrama and anecdotal commentary in all of his gesture to which I am negatively disposed. His rendering of anatomy, muscle and flesh fold, although idiosyncratic, is to my sense overstated. Murrillo to my surprise particularly touched John and the previous reservation I had concerning sentimentality was greatly altered in my reaction on seeing it through John’s eyes. 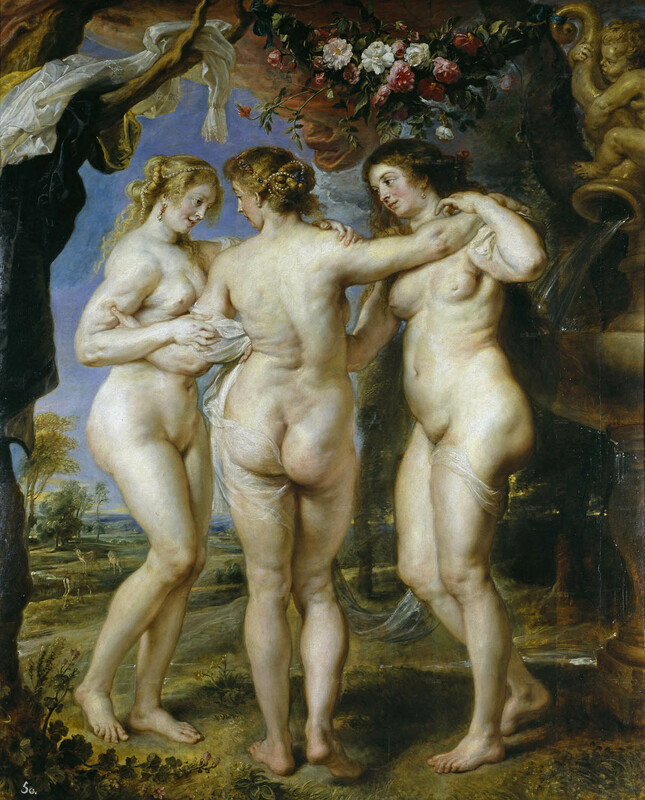 The “Three Graces” of Rubens is a masterpiece as is his “Judgment of Paris.” The splendor of this sumptuous painting overrides any reservations I have held concerning Rubens extravagance of gesture and illustrative content. Bosch’s paradise is truly an otherwordly work and it goes on and on. Zurbaran and his nobility of spirit evidenced in the grandeur of his solemn white draperies, his subtle interpretation of gesture (often in relation to a circumstance of miracle or revelation). It is sober, restrained and has a drama of compression. All is controlled, perhaps more accurately, a drama of impression. At 5:00 p.m., when the stores were again open, we went shopping. We looked for a gift for Shirley—John got cigars (Partagas in a marvelous wood box) and I got some art magazines with excellent reproductions. Back at the Ritz at 7:15 p.m. and then siesta until 9:15 p.m., dinner at Club 31 (same management as Jockey, but less posh). John’s brandy and cigar at the Ritz and to bed at about 1:30 a.m.
Cards and letters written in the a.m. after breakfast. Shopping all the day with lunch at the streetside café. We lazied about in the small parks that abound in Madrid. During the siesta time, we sat on benches under trees and later had an afternoon coffee in a streetside café. In an antique shop of Spanish furniture, ceramics and art objects, we bought a lovely Valencian plate. I found a handsome leather short coat. John and I bought alligator belts. That night a “typical” Spanish dinner at “Casa Botin.” Garlic soup, baby roast lamb, sangria, and flan. All good and picturesque atmosphere. After breakfast in our room we went to the Archeological Museum (particularly interesting are the small Iberian sculptures). After that, we went to the Goldiano collection housed in a private residence not greatly dissimilar from the Frick in N.Y. as a situation. Absolutely extraordinary collection of ivories and Byzantine enamels. Some paintings of Goya, religious vestments of gold threaded brocade, armor. The ceiling decoration was an amusement of personal frailty. Here was a connoisseur who had painted ceilings of allegorical subject matter in which the figures, all celestial in buffeting cloud filled skies were rather poorly painted stiff and pompous portraits of the collector garlanded and of his many mused family. Monstrous cupids cavorted. Such vanity! In this instance an utterly unreasonable folly without a redeeming capacity of humor. Later, while John took his siesta, I went to the Academia and saw four remarkable small Goyas, incuding the “Mad House,” “Festival” and “Bull Fight.” Two Velasquez portraits and four Zurbaran paintings of clergy in white robes. Dinner at the Sixto near the hotel and another good “typical” Spanish dinner. Walking in the warm and quiet evening. Here and there a person or two seated on chairs by doorways quietly conversing—almost murmuring. Black shawls and sleeping infants. All dignified and prideful—serious.